Valentine’s Day is nearly upon us and it’s a great excuse to brighten up our abodes in the otherwise often gloomy month of February. You might already have a fabulous boudoir but there’s no need to rest on your laurels when it comes to loving things up a little. Our bedrooms are our nest away from the hustle and bustle of a busy home, an opportunity to relax and make time for our lovers and partners. A drab, colorless bedroom is indicative of a drab, colorless life. So why not give it a little excitement when it comes to decorating? Here are a few ideas to turn your bedroom into a love-nest. Whenever we first step into a room, whether consciously or unconsciously, the first influence it holds over us is its colors. It’s well documented that colors can set our mood. And when we are trying to kindle that loving feeling, the last thing we want is to have bare walls of lifeless grey or off white. In the run-up to Valentine’s Day, card shops and supermarkets will have a whole host of pinks and reds lining their shelves. But you needn’t go for the cheap and tacky gift items (unless that’s your bag!). Take a look around for red or pink potential adornments to brighten up your bed or walls. Why stop at red and pink though? In the bedroom, we are royalty. Consider looking for shades of purple or gold. The occasional violet throw here or a gold-colored scarf there will give your room the regal feel with little effort. There’s no better way to show your love than to make something original. There are loads of tutorials online on how to learn papercraft. Find a decent craft shop and pick craft or tissue paper and card in the most vibrant colors. Now set some time aside at your kitchen table and get to work. The classic ideas are often the best if you execute them well. You can always make the traditional love hearts as well as paper roses. But why not get unconventional? If you’re feeling ambitious, try your hand at some origami, making a pair of lovebirds or swans. Don’t feel like you need to leave it until Valentine’s Day to get your other half involved. This is a fun activity that you can bond over. Once you’ve finished making them and placing them in your bedroom you can sit back and marvel at your creations together over a glass of bubbly. At Christmas, we have a tendency to go all out when it comes to decoration. Why should that not be so when it comes to Valentine’s Day as well? Sure it’s only one day out of a year. You can reuse many of the adornments you come up with or even leave them up as a reminder! 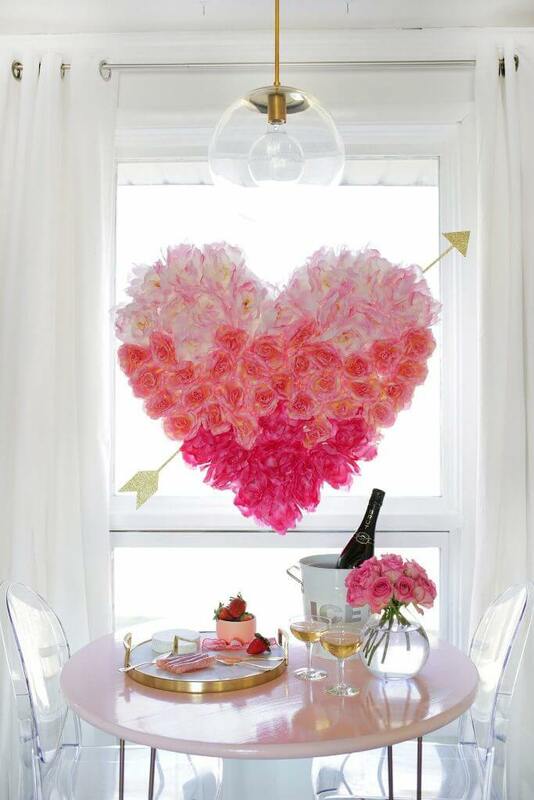 You’ve got the opportunity get really creative when it comes to Valentine’s Day decorations. You don’t need to leave at petals on the bed (which can get a bit messy anyway!). Think about getting hold of some new bedclothes. ‘Be Mine’ pillowcases or heart-emblazoned duvet covers are possibly a nice place to start but why not push it further? “Take inspiration from nature – adorn your walls with garlands of hearts or surround your lamp stands with sprigs of wild red berries (though be careful about which ones you choose),” – adds Paula Moya. For some, Valentine’s Day is about one thing only – chocolate. It should come as no surprise that chocolate – cocoa in particular – is a powerful aphrodisiac. Since time immemorial chocolate has been seen as a highly prized gift to those who are most important to us. Of course, it’s almost mandatory to bring the highest quality of chocolates for your love. Everywhere you’ll find red or pink foiled heart shaped chocolates which you can sprinkle liberally around your room, or fill up bowls or vases with. But if you want to get away from the cliché, think about other foods you can spice things up with. Bowls of fresh strawberries on the big day have no end of the romantic appeal. Be sure to get them closer to the day itself though, otherwise, they may start to turn. A room of love should be an assault on the senses. So look out for some colorful, sweetly scented foods or sweets to place around the room. Hotels around the world spend a lot of time and money on effective lighting. They know that harsh unforgiving light can really ruin a mood and make people feel self-conscious about how they look. This is the last thing you want for your love-nest. If you do have such lighting, it might be a good time to invest in some floor or desk lamps to turn things down a notch. Try to go for low wattage bulbs so that if you end up with a simple on/off switch lamp it doesn’t give off too much glare. “Remember that lighting a room is as much about shadow as it is about light so spend a little time manipulating your lamps in order to achieve a cool but not gloomy atmosphere,” says Teresa Sanders, lifestyle blogger, and writer at Researchpapersuk. Our most powerful sense is the sense of smell. More of our taste buds are more devoted to scent than they are to actual taste. This means there is great power in crafting delicate or evocative aromas. You should take advantage of this to ensure a pleasing but not overpowering aroma. The classic scent of passion is the scent of roses. Adding an array of white and red roses will brighten up any room. But you needn’t constrict yourself to roses. Other scented flowers include lavender, petunia or primrose. Don’t feel like you need to stop at flowers either. Baking heart-shaped brownies on Valentines is a great way to fill your house with a sweet pleasant aroma and give yourselves a treat as you curl up together in front of a movie. Clara Watkins is an experienced freelance writer who has written for many different websites throughout the world, including Lucky Assignments and Gum Essays. She is a passionate traveller and blogs frequently about lifestyle.